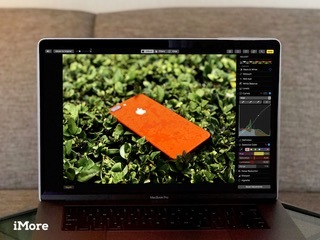 • High-Efficiency Image File Format (HEIF) for photos. • High-Efficiency Video Coding (HEVC), also known as H.265, for videos. Add anything new to iOS and it quickly gets disseminated to tens of millions of iOS devices. Note Apple’s comments about how it became the largest augmented reality platform overnight once AR technology shipped as part of iOS 11. We all suddenly had the chance to enjoy a T-Rex galavanting unencumbered around a basketball court. 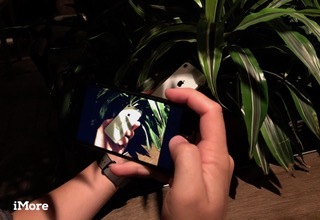 The two new formats have much better compression algorithms than JPEG and H.264, so photos and videos encoded with these formats will take up much less space on iCloud Photo Library and on flash-memory constrained devices like iPhones and iPads. Even though the new file formats compress photos and videos to a much greater degree, there is no loss of visual quality. 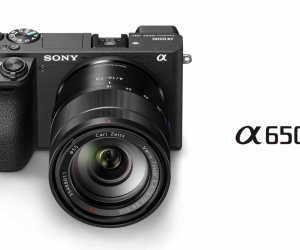 So… better quality and dramatically smaller file sizes? Sold! Where do I sign? The good news is that any photos or videos shot with recent iPhones (the 7 series or later) and iPads (the 10.5-inch and 2nd generation 12.9-inch Pro models) that are running iOS 11 will use these new media formats by default. You have the option of continuing to use JPEG and H.264 formats on these devices if you want. But because Apple has already built in a mechanism to convert a HEIF file to JPEG when it is shared (for example, through email or Messages) there’s no real good reason to use the less efficient JPEG format. 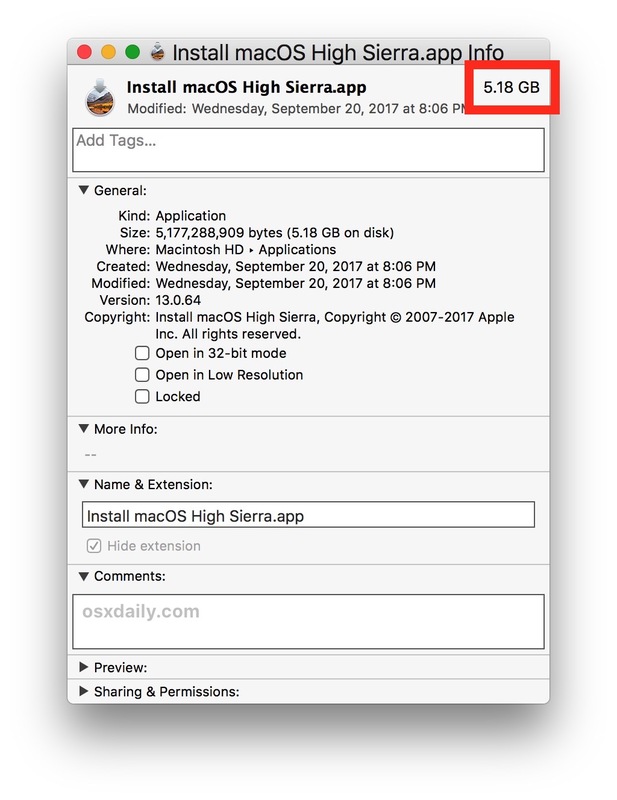 It’s a little dicier when it comes to sharing H.265 videos on some older devices, but the easy solution is to upgrade to macOS High Sierra and iOS 11 and work with the video in its new format. So we have a rosy future ahead, with the ability to stretch our storage a bit farther without an increase in cost, leaving all the more room for AR T-Rexes to fill. All of this, of course, begs the question: OK, so how do I convert all my old JPEGs to HEIF and H.264 videos to H.265? If saving space with no loss of quality is a good idea for new photos and video, isn’t it an even better idea for the thousands of photos and videos I already have that are sucking up precious storage space? The internet is full of websites that offer to convert a file based on one format into another. You can find them with a simple search. Here are two that I came across, both of which offer the ability to convert your JPEGs to HEIF and H.264 videos to H.265. And there are apps that’ll do likewise. But because HEIF and HVEC are only now emerging as future mainstream formats, many of these websites and apps either can’t handle the new formats at all, or have some detrimental byproducts, such as removing EXIF data (that is, data about a photograph, such as location and camera settings) during the conversion process. One website, JPEGtoHEIF lists step-by-step instructions for converting a JPEG to a HEIF, but it’s not for the faint of heart. If you understand terms like Homebrew, Git, cmake, and FFMPEG, you should give it a try and tell me how it worked out for you. But, if those sideloading programs kinda give you the shakes, do like I did and take a pass on that one. Nevertheless, I’m the curious sort. So I did a little digging for some Mac apps that handle conversion while also safely hide the command line from me. Handbrake, a free, open-source video transcoder, can convert H.264 files into H.265 format. I tested it with — what else? — a video of my cat playing with the business end of a laser pointer. The H.264 video was about 16 seconds long, 21.4 MB in size, and had a .m4v file extension. It took just a minute or so for Handbrake to convert it to the H.265 format. After conversion, the file was 5.4 MB in size (a 75% reduction in size compared to the original) and had a .mp4 file extension. Great! So it worked… but not really. The H.264 file would not open in QuickTime Player and only the audio played when I opened it with iTunes. So I tried it using VLC, a free video player that can handle a lot of different formats. To my eyes, there was no discernable difference in quality compared to the H.264 version (and the cat didn’t corral the laser in either version of the video, I know you wanted to know that). When it came time to drag the H.265 video into the Photos app so I could check on the status of the EXIF data, Photos wouldn’t take it. Even sneakily changing the file’s extension to .m4v didn’t work. 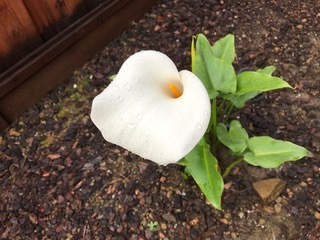 I used a couple of other apps to try to dig out the EXIF data to no avail. So, I re-transcoded it using Handbrake back into H.264 format. Again, it took just a minute or so and created a file that, at 6.5 MB in size, was slightly larger than the H.265 version. I was able to successfully import it into Photos with a drag and drop (even though it retained its .mp4 file extension), but the EXIM data — specifically, the date and location of the video and the camera information — was missing. Image2HEIF costs a few bucks on the Mac App Store and will convert images in various formats (BMP, GIF, JP2, JPG, and PNG) into HEIF. 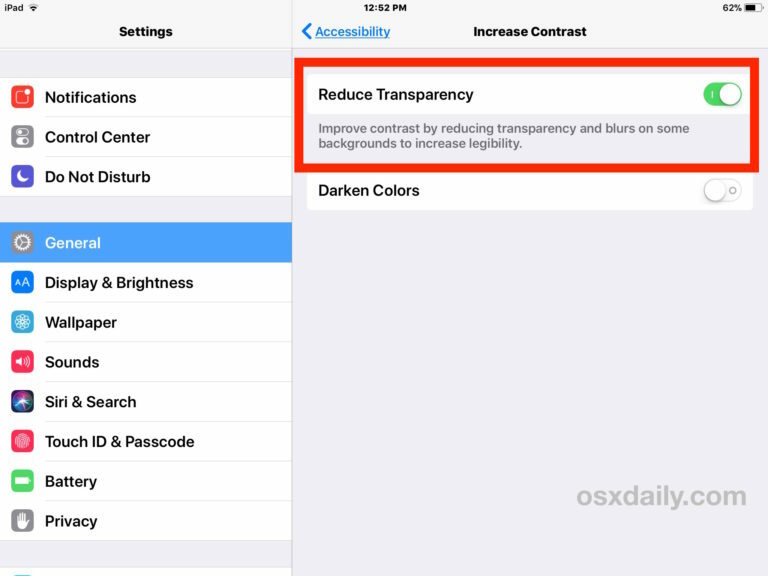 The app description makes it clear that “original EXIF/metadata is not transferred to converted .heic image”. So no important information is saved like date, location, or camera settings. In addition, while I successfully converted three different JPEG files and saw no discernible drop-off in quality, the file size was not reduced by a significant amount. In fact, in two of the three cases, the HEIC files were slightly larger than their JPEG originals. Just for fun, I converted a 3 MB JPEG file into a 20.9 MB PNG format using Preview’s export command. Then I ran the PNG file through Image2HEIF and it produced a 2.9 MB HEIF file. So, you know, what’s the point? To make things even more difficult, all of the HEIF files were locked when I opened them with Preview, and when I tried to unlock them, I was informed that the file didn’t support editing, so I was offered the chance to duplicate it into a TIFF format to edit. I could, however, just import and edit them in Photos. I’m not saying that a JPEG converted to HEIF is going to rampage through your neighborhood, drink all the water in your swimming pool, tear the roof off of your house, and swallow you whole. But it could do something that you might not like. At the very best, it’s a time-consuming process that doesn’t really reduce the file size that much. Based on my limited testing, it’s probably not worth the effort for most folks to convert a bunch of videos and photos to the new HEVC and HEIF formats just to save some storage space. A lot of time and effort would be involved to make the conversions — not to mention having to recreate lost EXIM data. For me, with the current level of technology available, it’s not worth the tradeoff. At some point, the formats will become more mainstream and Apple will likely build something into Photos and/or iCloud that will help take care of this. In meantime, I’m going to stick with what I’ve got. If you’ve tried converting photos or videos to the new formats, tell us about it in the comments below. 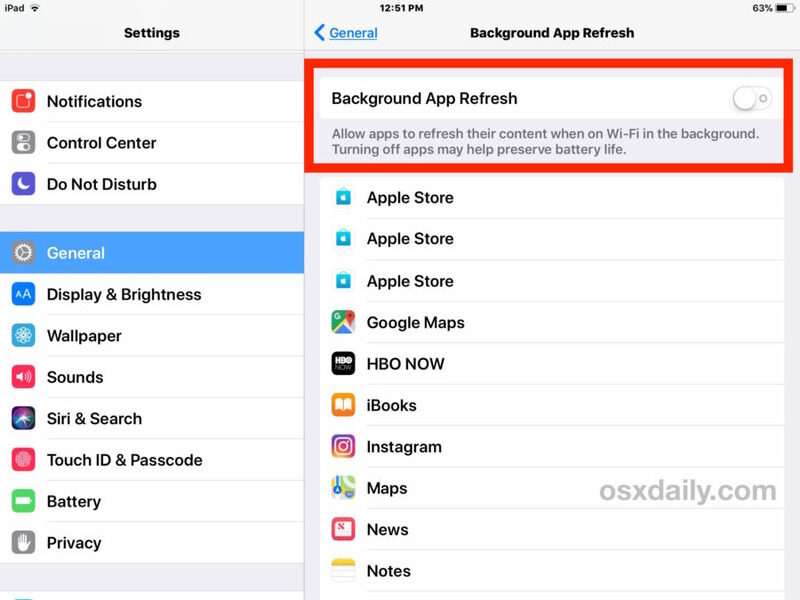 By the way, many of the tricks that help to speed up sluggish performance can also positively impact battery, so if you’re having iOS 11 battery life problems then you may find some cross-benefit to this approach as well. 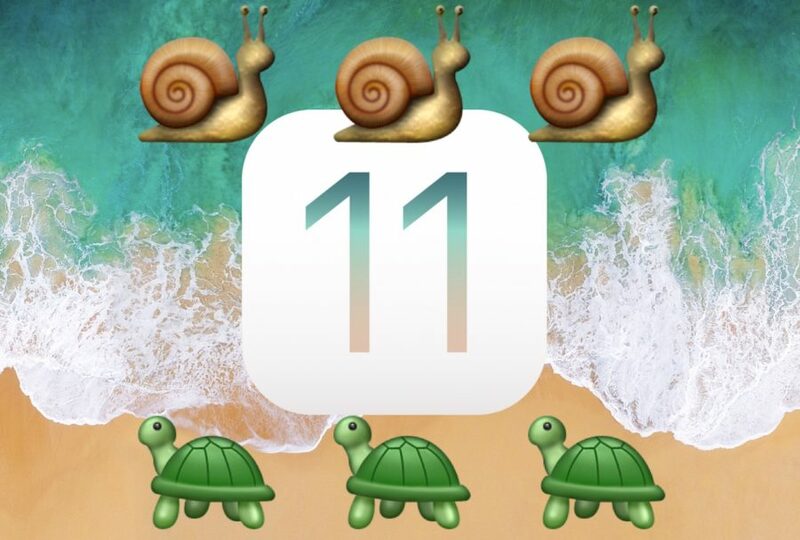 If you just updated an iPhone or iPad to iOS 11 and the device feels slow, have some patience. 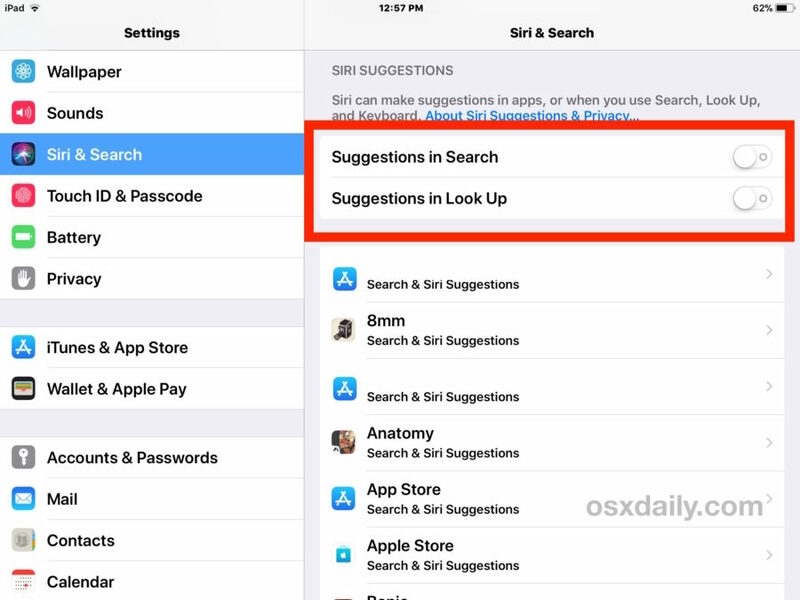 When a major software update arrives on your device, iOS will re-index everything for Spotlight, Siri, Photos, and perform other background tasks. This can lead to the feeling the device is slow because of the increased background activity being performed. The best thing to do is wait a few days, leave the device plugged into a wall outlet overnight, and let it complete whatever system behavior is necessary. After a night or two things usually behave normally again and performance is often better, and often this fixes battery life problems too. 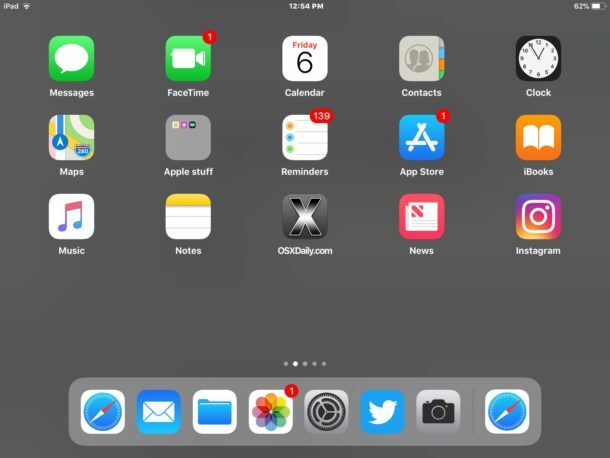 For most iPhone and iPad devices, hold down the POWER BUTTON and the HOME BUTTON concurrently until you see the  Apple logo appear on screen. On iPhone 7 and iPhone 7 Plus, hold down the VOLUME DOWN BUTTON and POWER BUTTON concurrently until you see the  Apple logo appear on screen. Then just wait for the device to boot back up again. The Home Screen might look a bit more boring when a simple background wallpaper picture, (or not, depending on your taste) but it also might feel a tad faster. Try it out, you can use the simple tiny gray image wallpaper below if you’d like, or find your own. 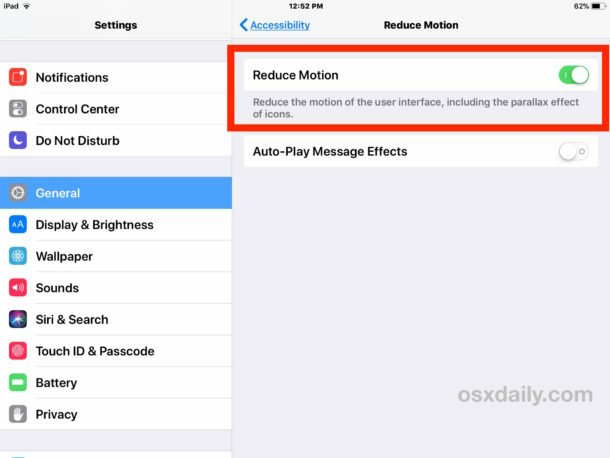 * While in Reduce Motion settings, you might want to turn off “Auto-Play Message Effects” too, since those animations in Messages app can also make things feel a bit sluggish sometimes. When you turn on Reduce Motion, the zipping and zooming effects of opening and closing apps is replaced with a simple subtle fading animation too. Using Increase Contrast can make things look a bit plain, but using things like Control Center should feel faster as a result. This is important, and if your iPhone or iPad is full or very low on storage, performance will suffer, plus you won’t be able to install updates to apps or system software, and other strange behavior can occur like locking a user out of their email, data being mysteriously removed from the device, amongst other curiosities. Always aim to have some storage space available. 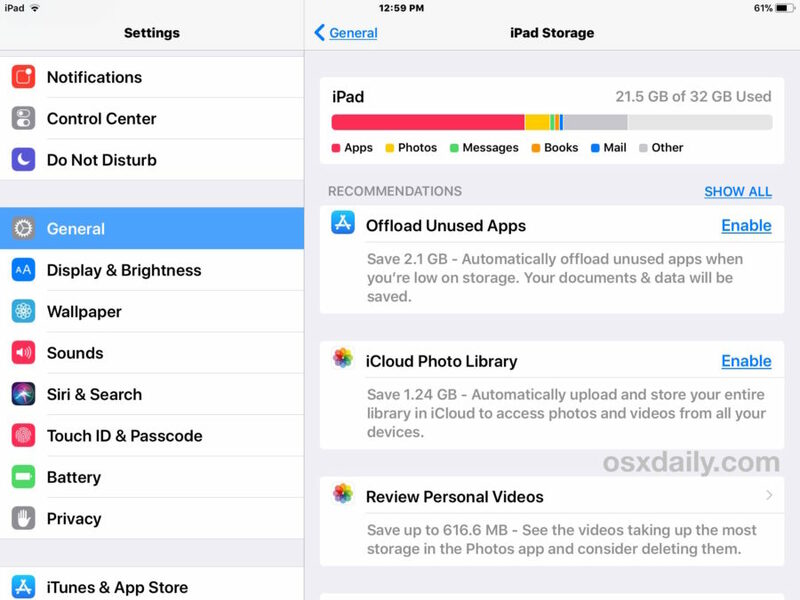 A common troubleshooting trick is to backup a device to iTunes or iCloud, then restore iOS. This can sometimes fix obscure performance issues, and if you contact Apple to troubleshoot a device they will likely want you to perform this action as part of their process. 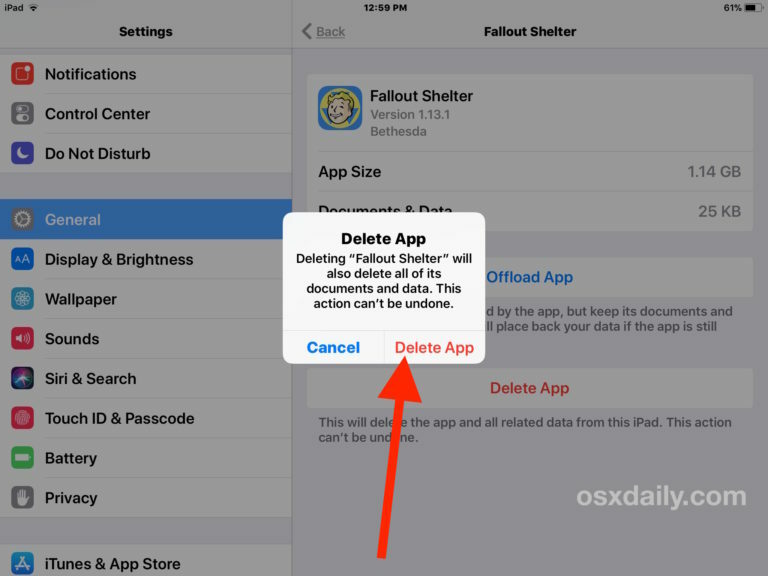 You can backup to iTunes, or iCloud, or both. Always backup before beginning a restore process. Using iTunes with the device connected to the computer, you then choose to “Restore” the device. 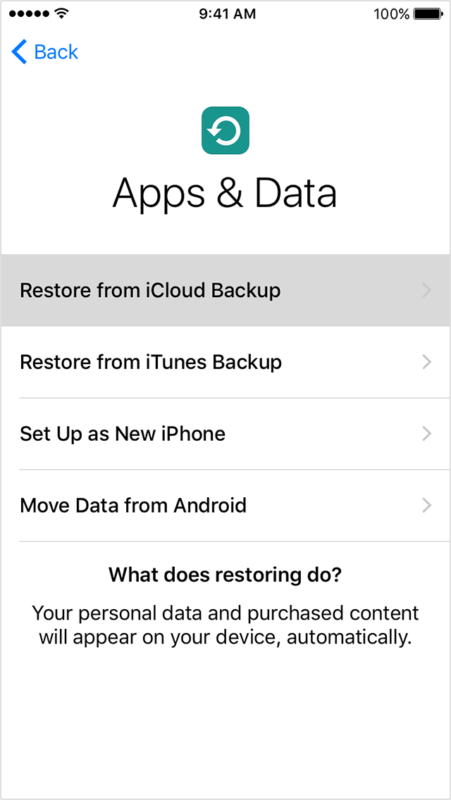 Or you can choose to Restore directly on the device itself and select either iCloud or iTunes backup to restore from. Some users may also try setting up a device as new which means nothing is on the device at that point. An obvious flaw to that approach is the iPhone or iPad would be lacking any data, images, pictures, photos, notes, apps, contacts, or any other personal information. This is why most users choose to restore from a backup instead of setting up as new. Nonetheless, if you don’t care about that, setting up a device as new can sometimes make it feel snappier. What about reverting from iOS 11 back to iOS 10? Some users may wish to downgrade iOS 11 back to a prior version of system software on their iPhone or iPad. While reverting to the prior iOS release was possible for a while, unfortunately this is no longer an option for most devices, because Apple has stopped signing the iOS 10.3.3 firmware. You can learn about how to check iOS IPSW firmware signing status here if the topic interests you. Have you noticed any performance issues with iOS 11? Did these tricks help to speed up your sluggish iPhone or iPad? Do you have any tips to help speed up a slow iPhone or iPad? Have you had other iOS 11 problems to troubleshoot? Let us know your experience in the comments below! 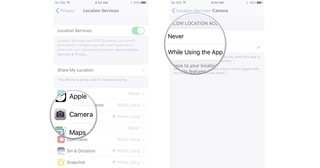 How do I turn off location tagging for photos on iPhone and iPad? 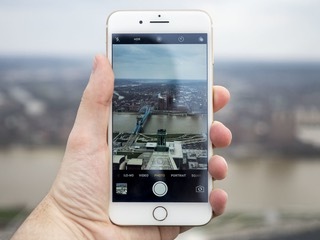 By default, the Camera app on your iPhone and iPad records geographic data, along with a bunch of other metadata, which basically tells you where the photo was taken. This is perfect for when you want to look for photos you took while on holiday in Italy, but it isn’t always great when sharing photos with the public, like you would on Facebook or Instagram. 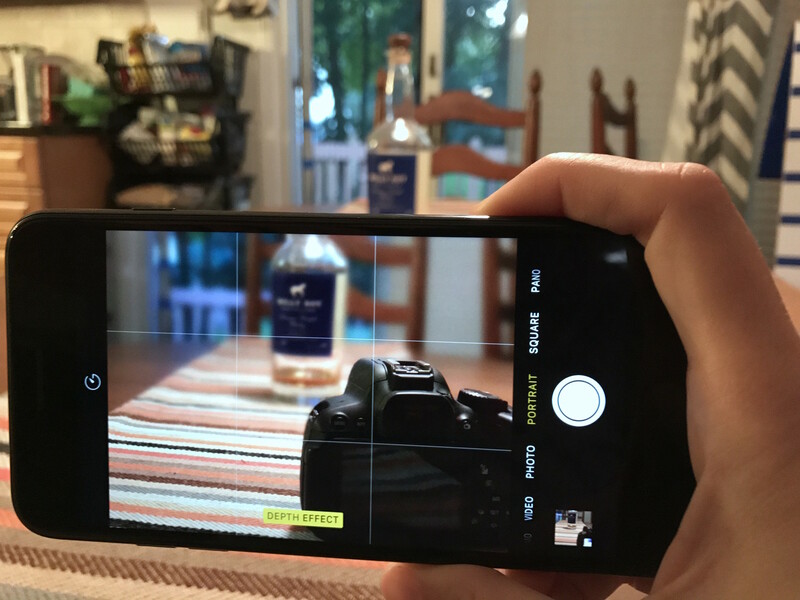 Which smartphone camera do YOU like the best? iPhonen justerer selv skærmens baggrundsbelysning alt efter lysintensiteten i omgivelserne. Det betyder at lyset i skærmen dæmpes når det er mørkt, mens der skrues op for lyset hvis man går uden for i solskinsvejr. Lysintensiteten registeret af en lysmåler der sidder i den øverste kant på forsiden af iPhonen. Ideen med automatisk justering af skærmens lysstyrke er dels at det sparer batteri og dels at sikre en ensartet synsoplevelse. Skærmens lys er noget af det mest energikrævende i iPhonen, så det giver god mening af få skruet ned automatisk, når ikke der er behov for det. Omvendt skrues der så også automatisk op, når der er behov for det for at sikre at man overhovedet kan se hvad der er på skærmen. Funktionen er altså smart nok. Der kan dog være situationer, hvor man ønsker selv at styre lyset. Måske er man bare ikke enig i den automatiske justerings valg eller måske ønsker man at at spare på strømmen ved at holde lysstyrken lav også i kraftigt lys. Derfor har man tidligere kunnet slå funktioner fra i Indstillinger under skærm og lysstyrke. Med lanceringen af iOS 11 er den mulighed forsvundet. Eller rettere sagt: Den er blevet flyttet et andet sted hen. Apple er blevet så sikre på at den automatiske funktion ved bedst, at man skal ind i indstillingerne for folk med særlige behov for at slå det fra. Indstillinger > Generelt > Tilgængelighed > Tilpasning af skærm. Her skal du slå “Automatisk lysstyrke” fra. Læg mærke til at der nedenunder funktionen står at det kan påvirke batteritiden. Dette er væsentligt. Skruer du lyset for højt op påvirkes batteritiden negativt, men omvendt kan du påvirke den positivt ved at skrue lyset for langt ned. Alt i alt er det bedste nok at lade funktionen være slået til. 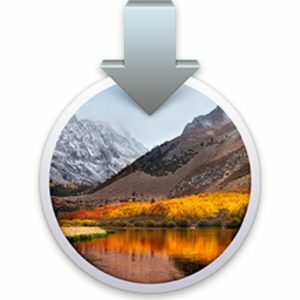 Many Mac users who are attempting to download macOS High Sierra from the Mac App Store will find that a small 19 MB version of “Install macOS High Sierra.app” downloads to the /Applications folder of the target Mac, rather than the complete 5.2 GB Installer application for macOS High Sierra. 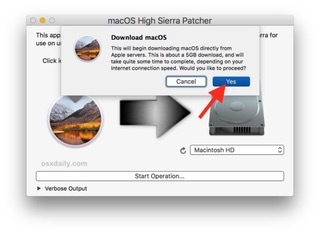 This is annoying because it prevents a single download from being used on multiple computers, plus the small installer requires an internet connection during usage to download the rest of the High Sierra update files. 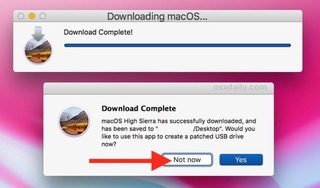 Additionally, the tiny 19 MB incomplete installer prevents users from being able to create a macOS High Sierra USB installer drive or other custom update options available through the command line, like skipping the APFS update. 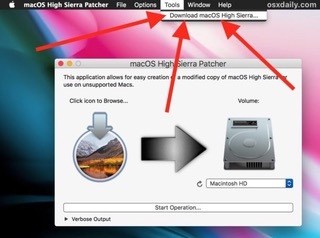 This tutorial will show you a workaround trick that allows Mac users to download the full macOS High Sierra “Install macOS High Sierra.app” file at 5.2 GB with the complete installer tool set and all dmg files and associated Install macOS High Sierra.app/Contents/Resources/ tools, rather than the tiny incomplete truncated installer at 19 MB. Med de officielle lanceringer af iOS 11 og macOS High Sierra har Apple samtidig lanceret understøttelse af to helt nye filformater. Det er billedformatet HEIF og videoformatet HEVC. De er udviklet af Moving Picture Experts Group (MPEG) og er altså ikke Apples eget format. Det er meget mere interessant end det umiddelbart lyder. De to formater har nemlig en række fordele sammenlignet med de formater vi normalt bruger til billeder og video. Først og fremmest kan de spare en masse plads på vores enheder. HEVC er en forkortelse for High Efficiency Video Coding. Det er et relativt nyt videokomprimeringsformat, der er tænkt som en efterfølger til det meget udbredte H.264-format. HEVC er derfor også kendt under navnet H.265. HEVC byder på dobbelt så god videokvalitet ved samme bitrate som H.264. HEVC understøtter desuden opløsninger op til 8192×4320 pixels herunder 8K UHD-video. Helt lavpraktisk betyder det at dine videofiler fylder mindre end de ellers ville have gjort uden at kvaliteten forringes. Det betyder mindre behov for lagerpads og at du kan streame film i højere kvalitet uden behov for hurtigere netforbindelse. Du vil desuden typisk opleve færre komprimeringsfejl og en mere flydende afspilning. HEVC-videoer bliver gemt med fil-endelsen .mov – som almindelige iPhone-videoer – men altså komprimeret med H.265. Du kan altså ikke se på filnavnet om en video er af HEVC-typen eller ej. HEIF er en forkortelse for High Efficiency Image Format. Det erstatter JPEG-formatet der ellers har brugt til billedlagring i næsten 25 år. Teknisk set er HEIF faktisk sket ikke et billedformat men en container (lige som .mov er det). Det eller de billeder der er i HEIF-containeren er i praksis komprimeret via HEVC-formatet nævnet ovenfor. Derfor egner HEIF sig også specielt godt til Apples Live Photos og billeder fra duel-kamera iPhones. HEIF har en del fordele sammenlignet med JPEG. HEIF har en mere effektiv algoritme til komprimering af billeddata. Det giver en bedre kvalitet, er hurtigere at arbejde med og ikke mindst giver det billeder der fylder under det halve af hvad de ville gøre med JPEG. Det mindsker behovet for plads på iPhonen samt der hvor man ellers lagrer sine billeder. En anden fordel er at HEIF byder på ikke-destruktiv redigering af visse ting som beskæring og rotation. Derudover understøtter HEIF et bredere farvespektrum. HEIF-billeder gemmes med filendelsen .heif. Hvilke enheder understøtter HEIF og HEVC? For at kunne optage og encode billeder og video i HEIF- og HEVC-formaterne skal din iPhone eller iPad have en A10-processor eller nyere. Det dækker blandt andet iPhone 7 og de nye iPhones samt 10,5″ og 12,9″ iPad Pro. Alle iOS-enheder med iOS 11 kan til gengæld godt afspille HEVC-videoer. Understøttelse af formatet er nemlig bygget ind i iOS 11. Der kan dog være nogle af de ældre enheder, der ikke understøtter høje opløsninger da de mangler hardwareacceleration. 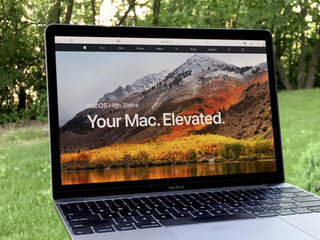 På Mac understøttes HEVC af alle Macs der kan køre macOS High Sierra. Kan man slå HEVC og HEIF til og fra? Hvis din enhed understøtter de nye formater, vil de som standard blive brugt til nye videoer og billeder. Du kan manuelt skifte mellem HEVC/HEIF og de gamle formater i Indstillinger > Kamera > Formater. Hvis du vælger “Pladsbesparende” vil din enhed benytte de nye formater. Hvis du vælger “Mest kompatible” vil din enhed benytte de gamle formater. Kan man stadig dele billeder med andre? Den største reelle ulempe ved de nye formater er at det i øjeblikket praktisk taget kun er Apple der understøtter formatet. Det må dog forventes at understøttelsen vil brede sig til de fleste andre nye enheder over de næste par år. Det er dog ikke et problem, hvis du vil dele dine billeder med andre. Hvis du deler et billede med en anden iOS-enhed der ikke understøtter de to nye formater, vil iOS 11 nemlig selv konvertere HEIF og HEVC til de gamle formater der kan bruges over alt. Det samme sker hvis du deler til ikke-Apple-enheder eller apps der mangler understøttese af de nye formater. Du kommer altså ikke til at lide under at understøttelsen af HEIF og HEVC uden for Apples eget økosystem er begrænset. Blot vil dem du deler billedet med ikke få fordelene af det nye format. Kan man konvertere eksisterende JPEG-billeder til HEIF – og bør man? En detalje er at det kun er nye billeder og videoer der gemmes i HEIF og HEVC. Ens eksisterende billeder og videoer bliver altså ikke konverteret til de nye formater. Du kan dog konvertere dem manuelt, hvis du vil. Det er en lidt langhåret proces, så jeg vil nøjes med at henvise til jpgtoheif.com hvor du kan finde en vejledning. Om denne omkodning er tabsfri tvivler jeg på, så jeg vil ikke umiddelbart anbefale nogen at konvertere alle deres billeder til HEIF bare for at gøre det. Pointen her er i virkeligheden at HEIF er fremtidens format. Det er på de billede du tager fremadrettet – og ikke på dine eksisterende billeder – du vil få alle fordelene. Det korte af det lange er altså at du med de to nye formater får bedre billedkvalitet på mindre plads. Der er ikke rigtigt nogen argumenter for ikke at benytte HEIF og HEVC, hvor det er muligt. If you’re having problems printing from your Mac, this hidden tool will likely solve your problem. We’ve all run into a printing problem at one time or another. Sometimes a document gets stuck in the queue and won’t print, or your Mac can’t find your printer on your network. But occasionally, these simple fixes are not enough. That’s when you have to bring out the heavy-duty tools. There’s a hidden command in macOS that will reset the Mac’s printing system. Using it will clear out your list of devices that can print, scan, or fax from the Printers & Scanners preference pane and also do a bunch of behind-the-scenes housekeeping, the details of which you don’t really need to worry about. Because it should be used as a last resort, you won’t find the command to reset the printing system in any of the Mac’s standard menus, which makes it harder to invoke accidentally. But it’s simple to do if you know how. Right or control-click in the list of devices on the left side of the window. Click on Reset printing system…. Click Reset when prompted to confirm that you want to reset your entire printing system. Enter the password for your administrative account if prompted. When the reset process is complete, the list of printers and scanners will be empty. You’ll then want to re-add your printer. Click the add button (it looks like a plus symbol). If the list of options appears, click on your printer to automatically add it to your system. If a window pops up instead, select your printer from the list of available options. 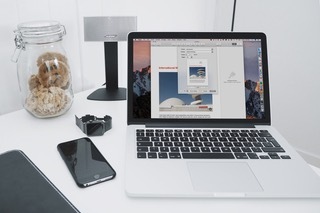 The Mac will create your printer and add it to your list. And now you have a fresh new printer, ready to expend countless dollars of ink on your behalf. Do you have any printing problems that none of these steps can solve? Let us know in the comments and we’ll try to help you out. Læs mere om, hvordan du indstiller dit Apple Watch med din iPhone. På iPhone: Gå til Indstillinger > Bluetooth, og kontroller, at Bluetooth er slået til. Kontroller, at din iPhone er sluttet til Wi-Fi eller et mobilnetværk. Hvis du allerede har indstillet dit Apple Watch, men vil bruge det sammen med en anden iPhone, kan du overføre dit Apple Watch og dets indhold til din nye iPhone. 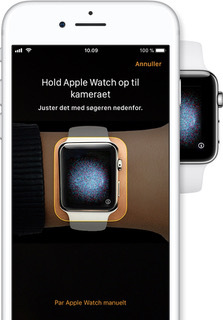 Du tænder dit Apple Watch ved at trykke på sideknappen og holde den inde, indtil Apple-logoet vises. Det kan tage et par minutter. Få hjælp, hvis dit Apple Watch ikke tænder, eller hvis du bliver bedt om at indtaste en adgangskode og har glemt den. Hold dit Apple Watch og din iPhone tæt på hinanden. Vent, til beskeden “Brug din iPhone for at indstille dette Apple Watch” vises på din iPhone, og tryk derefter på Fortsæt. Hvis du ikke ser beskeden, skal du åbne appen Apple Watch og derefter trykke på Start pardannelse. Hold dit Apple Watch og din iPhone tæt på hinanden, indtil du har udført disse trin. Anbring derefter urskiven midt i søgeren på din iPhone. Vent, til der vises en besked om, at dit Apple Watch er parret. Hvis du ikke kan bruge kameraet, skal du trykke på Pardan Apple Watch manuelt og derefter følge de viste trin. Vælg derefter, hvilket håndled du vil have dit Apple Watch på. Læs Vilkår og betingelser, og tryk på Enig og derefter igen på Enig for at fortsætte. Skriv adgangskoden til dit Apple-id, hvis du bliver bedt om det. Hvis du ikke bliver bedt om det, kan du logge ind senere fra appen Apple Watch: Tryk på Generelt > Apple-id, og log ind. Nogle funktioner, der kræver et mobiltelefonnummer, fungerer ikke på Apple Watch Series 3 (GPS + Cellular), medmindre du logger ind på iCloud. Hvis Find min iPhone ikke er indstillet på din iPhone, bliver du også bedt om at slå Aktiveringslåstil. 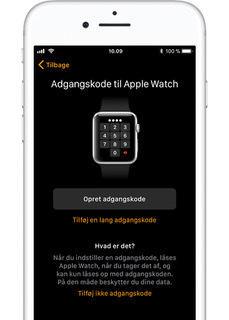 Hvis du får vist skærmen Aktiveringslås, er dit Apple Watch allerede knyttet til et Apple-id. Du skal indtaste e-mailadressen og adgangskoden for det pågældende Apple-id for at fortsætte indstillingen. Hvis dit Apple Watch har haft en tidligere ejer, er du muligvis nødt til at kontakte den tidligere ejer for at få fjernet aktiveringslåsen. Du kan indstille Lokalitetstjenester, Registrering af rute og Siri. Hvis Siri ikke allerede er indstillet på din iPhone, slås funktionen til, når du vælger denne indstilling. 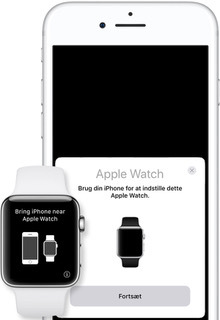 Dit Apple Watch viser derefter, hvilke indstillinger der deles med din iPhone. Hvis du har slået Find min iPhone, Lokalitetstjenester, Wi-Fi-opkald og Diagnosticering til på din iPhone, slås disse indstillinger automatisk til på dit Apple Watch. Du kan springe over oprettelse af en kode, men du skal bruge en til funktioner som f.eks. Apple Pay. Tryk på Opret adgangskode eller Tilføj en lang adgangskode på din iPhone, og skift til dit Apple Watch for at indtaste den nye kode. Tryk på Tilføj ikke adgangskode, hvis du vil springe det over. Du bliver også bedt om at indstille Apple Pay ved at tilføje et kort. Vi vil gennemgå indstillingen af funktioner som f.eks. SOS og Aktivitet. På Apple Watch Series 3 (GPS + Cellular) kan du også indstille mobilforbindelse. 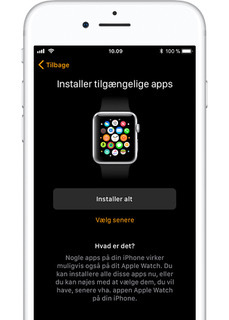 Derefter kan du installere de apps, der er kompatible med Apple Watch. Synkroniseringen kan tage et stykke tid, afhængigt af hvor mange data du har. Mens du venter på, at dit ur synkroniserer, kan du prøve de grundlæggende funktioner i Apple Watch. Hold enhederne tæt på hinanden, indtil du hører en lyd og mærker feedback fra dit Apple Watch. Tryk derefter på Digital Crown. Læs om bevægelser, der styrer dit Apple Watch, og om de apps, du kan bruge. Du kan også læse Brugerhåndbog til Apple Watch, tilpasse urskiven eller tilføje eller fjerne apps. Find dit problem herunder, og læs, hvad du skal foretage dig. Hvis du stadig har brug for hjælp, skal du kontakte Apple-support. Du skal måske oplade dit Apple Watch. Dit Apple Watch er stadig parret med en anden iPhone. Hvis du ikke kan huske koden, skal du slette dit Apple Watch og derefter indstille det igen. Dit Apple Watch er knyttet til et Apple-id. Du skal indtaste e-mailadressen og adgangskoden for det pågældende Apple-id for at fortsætte indstillingen. Hvis dit Apple Watch har haft en tidligere ejer, er du muligvis nødt til at kontakte den tidligere ejer for at få fjernet aktiveringslåsen. Kontroller, at du har installeret den nyeste version af iOS på din iPhone. Sluk din iPhone, og tænd den igen. Sluk dit Apple Watch, og tænd det igen. Du kan forbinde dine enheder igen. 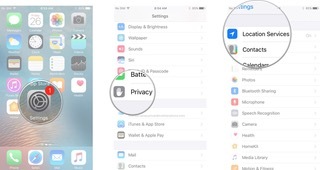 App-specific data (for built-in apps) and settings (for built-in and third-party apps). For example, Maps, distance, and units and your settings for Mail, Calendar, Stocks and weather. When you unpair your Apple Watch from your iPhone, your iPhone automatically creates a backup of your Apple Watch. Unpairing will erase all data from your Apple Watch. If your Apple Watch is unpaired while out of range of your iPhone, the backup might not have the latest data. When you’re ready, you can pair your Apple Watch again and set it up from a backup.